Finally our air is pretty clear and we are not seeing fire trucks everywhere. The roads to Yosemite are open and the businesses that depend on tourism are buzzing again. Everything was pretty quiet here during the fire as none of us wanted to go out in the smoke. We are so happy that none of our friends in the fire area suffered any losses. It is never easy to evacuate, although sadly, it seems to be our new way of life. As we get back in the swing of things, we are looking forward to having Julie Kelly visit us this month to teach classes using the Lawn Fawn fall and winter releases. Each class will be about 2 1/2-3 hours and the cost is $30 per class. If you want to sign up, please call us at 559-642-6611. The classes are on Saturday, September 22nd and possibly Friday, September 21st. 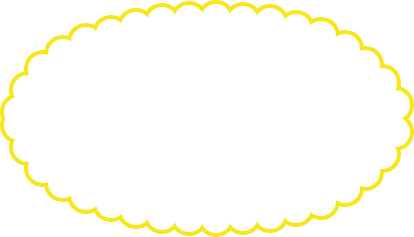 Check out the cute cards you will make! 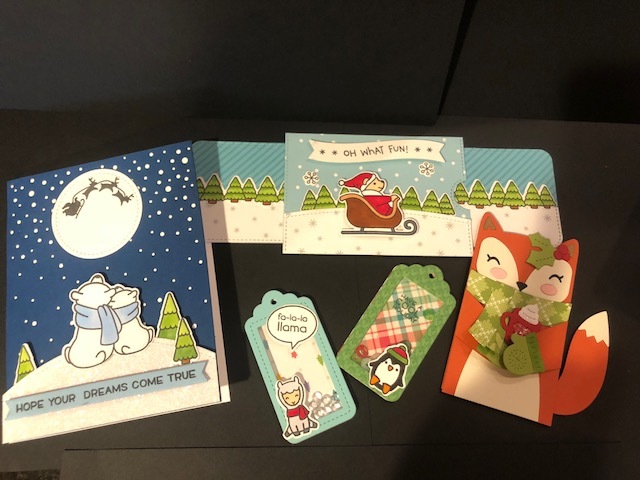 As you can see you will get to make cards using the double slider, reveal wheel, and mini pop-up box as well as other fun techniques. As you probably know, the 2019 Stamp Escape is full and we are taking a wait list. If you are interested in attending, I do urge you to call us to get on the wait list. We usually take 10-12 people off the list as over the course of the year, things change, plans are made, and there are always people who need to drop out. We are ramping up for fall and winter with new papers, stamps and dies coming in all the time. If you had your heart set on a Tim Holtz Stamp Platform, I have three left in stock and we are selling them at 25% off. You may have heard that Tonic (the manufacturer) will no longer be selling them in the US, so this is your chance to get one if you have been putting it off! We hope you have all survived the summer so far. With this weird weather, who knows when fall will begin. We just hope and pray that "fire season" is over and everyone is safe. Stop by soon to check out all of the new goodies. We have received lots of orders even though we are in a seasonal transition period right now. We have received some new wood pieces from Foundations Decor. Melissa's wood class this month will feature the candy corn pieces that fit in the top of the wood barrel from the July class. If you are interested in the 12 month seasonal barrel classes and missed the first two, you can always catch up. The September class will be your decor piece for Halloween, your October piece (acorns) will be your decor piece for fall/Thanksgiving. You get the idea. Of course you also get to make a card of the same theme. Speaking of Fall, we have new Fall images from Impression Obsession. Lots of cute images, and we still have some of their under-sea images, too. Although it is hard to describe, we have this amazing new cardstock from Paper Cut. It is 8.5x11, and it has a beautiful satin finish. Right now we have it in red, a royal blue and a rich brown. This is really a "see it to believe it" product! It is A-mazing! Of course we have lots of product from the fall winter release of Lawn Fawn in anticipation of Julie's classes. We love their new paper collections, too. 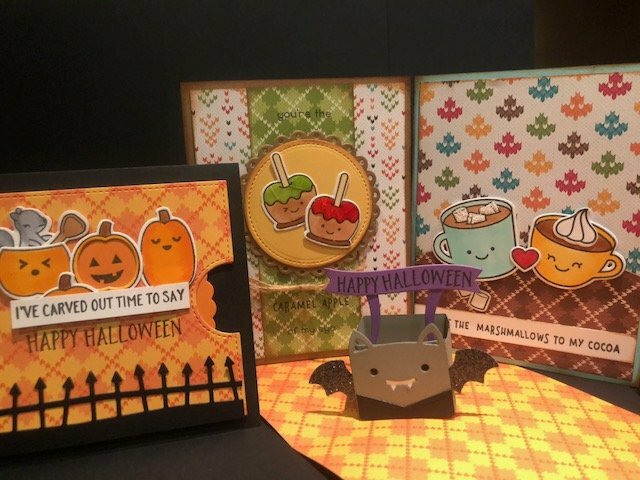 The Gina K fall release came in including the Fall Wreath Builder and the very popular Connect Glue! We have the Holiday Wreath Builder on order and should have it soon. We have a new shipment from Altenew including their Pan Watercolors.I particularly like the Peruvian Lily layering stamp and die sets. We also ordered some of our favorite word sets. We are expecting the Penny Black release soon, just not sure of the exact date yet. There are always lots of fillo-in things like new colors of Nuvo, inks, embellishments and other goodies that come in during the money. Stop in and take some time to browse around. There is always something just perfect for your next project! We have Yupo paper in 8.5x11 by the sheet and should have a reorder of Lift Ink (that is used to lift alcohol ink off of backgrounds and stamp them onto another surface) coming in again this week. Check out the class schedule at by clicking here!